" In STOCK " now ships same week !!! Ships to nearest FedEx Freight hub location, you pick it up there. See our website "INSTRUCTIONS" tab for electrical hook-up etc. Our shipping & handling price of $349 includes all the handling misc. expenses plus labor, crate materials, and the billable rate from FedEx. - Please Read >>> If the name hasn't already got your attention..., the industry killing price will. We want to advertise our price because we're proud to sell equipment at a practical and very realistic level. 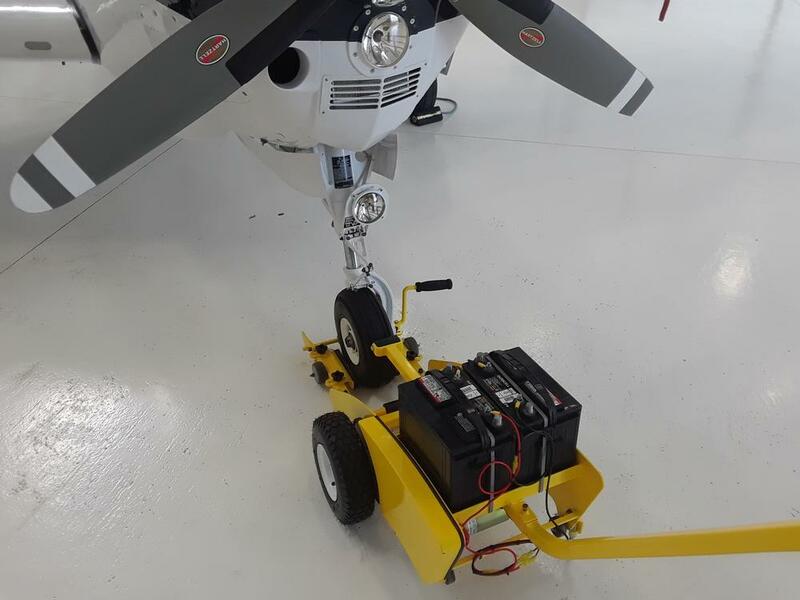 This aircraft nose wheel tug, our Nose-PICKER comes with (2) Smart Battery Maintainers that automatically shut off. This little tugger has a tugging capacity of almost 5,000 pounds Shipping weight including container approx. 180 pounds, ships 95% assembled via freight on a semi truck in a very sturdy fully covered wooden create to your nearest FedEx hub dock anywhere in the lower 48 states and you pick it up from there. All other shipments including overseas will have to be quoted at the time of ordering. ** Airventure 2018 ** Lets set the record books straight. Did you want a powerful TUG at a great price..?? Well rumor has it that we took the top spot for that. About 30 years of lessons learned experience with customers designing and building high quality aircraft ground support equipment for the general aviation and aerospace industry has earned us a top ranking. We will be there to show off our latest PICKER designs, answer all your questions and as always be the ones with the - - best bang - - for your hard earned dollar. We could design a rolling computer show but why? At the end of the day all we want to do is help you move your plane as efficiently as possible. The booth has been secured in Hangar "C" and we are looking forward to meeting you. We are already prepararing for the show, it's going to be great to see everyone of you again and shake your hand with a big hello. While the name "Nose-PICKER" may bring a smile to your face or make you chuckle, this is a serious machine. ** Recommended up to about a 5,000 pound aircraft. • What you see pictured here is a very powerful high torque heavy duty machine fabricated as a bullet proof welded construction chassis. The Chassis alone could likely withstand an even larger aircraft and to withstand not years but literally decades of abuse. It has been designed with features other tugs simply do not have. We typically undersell and over deliver our Nose-PICKER. • This PICKER handles a 5,000 pound aircraft moving backwards uphill over lips and door tracks into a hangar. • This Nose-PICKER will ship assembled inside a wooden create with exception of the handle bar and front swing gate, you will have to attach them with some locking bolts. No adapters needed, it's universally engineered for 500 x 5.0 & 600 x 6.0 tires and more. No paint chips or scratches on the side of your wheel pants, we stay under all of that. No hand cranking of winches. No crawling under the aircraft and wrap stretch straps around your landing gear. No heavy lifting on the handle grips to move the aircraft. No need to force the tug details under the Landing Gear.